As if its imposing presence on the road and the inimitable rumble of its 5.7-litre Hemi V8 engine was not enough, the 2019 RAM 1500 Laramie will now sport a new grille and raised chrome badging on the tailgate. The new ‘high viz’ RAM look for the 1500 Laramie is the most obvious change to the RAM 1500 model since its launch last year, while its Express sibling gains a new reversing camera and trailer brake control. “Since its launch last year, the RAM 1500 has proven to be the outstanding success for RAM in Australia that we expected, a point proven in February by the Australian production line achieving more than 200 vehicles re-manufactured in a month for the first time,” RAM Trucks Australia GM Alex Stewart said. In response to demand, the company has ditched the traditional grille for the new look chrome grille with the word RAM emblazoned across its front. The RAM 2500 Laramie has also picked up the same add-ons as its little brother. “Given the performance of the Hemi V8, many people’s first sight of a RAM 1500 will be as it goes past them so, once again, there is no mistaking the RAM 1500, it now has RAM adorning the tailgate in 30 cm high raised chrome lettering,” Stewart said. Every RAM truck is built specifically for the Australian market with a host of features and equipment from rear lights to the audio system. They are then shipped to Melbourne where they are re-manufactured to right hand drive in a factory-approved process. Pricing for the RAM 1500 starts at $79,950 plus on-roads, with the 1500 Laramie priced from $99,950 plus on-roads. It has a larger interior and load tray than its competition, and a towing capacity of up to 4.5 tonnes. There’s also a choice of axle ratios and unique options such as the versatile RamBox cargo management system. 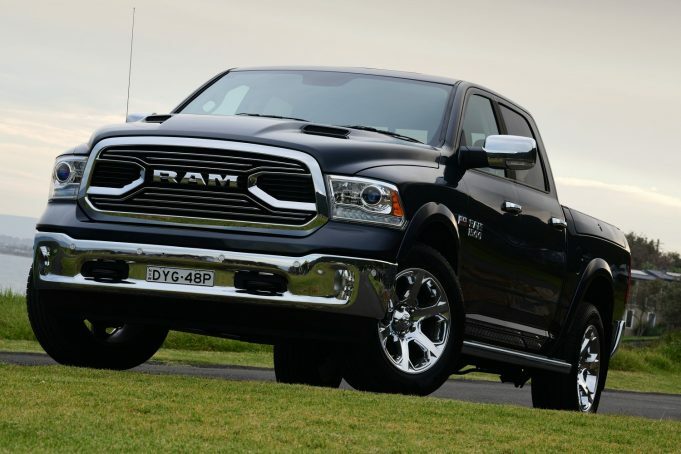 The RAM 1500 is powered by a 291kW Hemi V8 engine matched to an eight-speed gearbox.